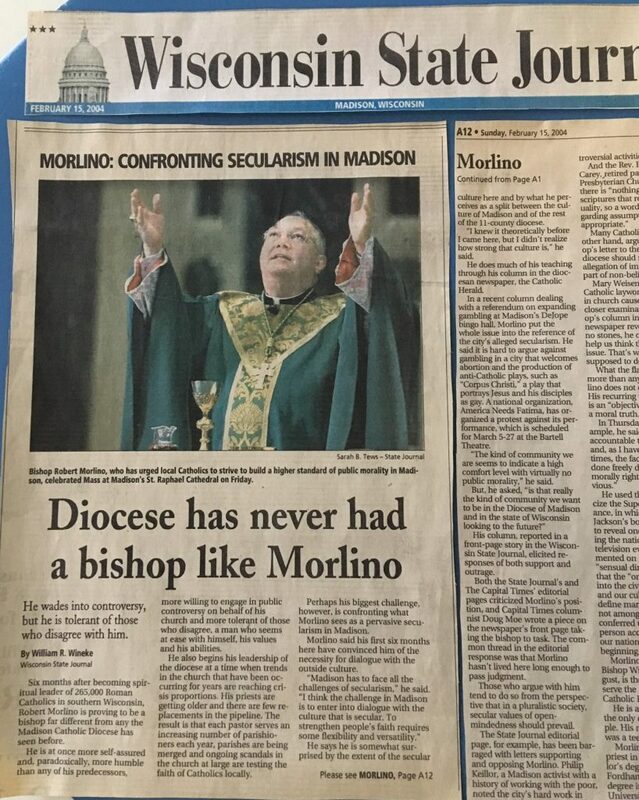 Not being much of a newspaper clipper, nor information hoarder, I was surprised to unearth several treasures in my basement, including notes I took at a Future Society meeting addressed by Bishop Morlino and a Wisconsin State Journal article which introduced Bishop Morlino to Madison almost exactly fifteen years ago, on February 15th, 2004, about six months after his arrival in Madison. 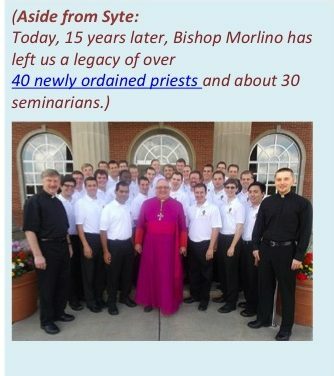 The front page Sunday article was remarkably positive, surprisingly perceptive, and provides one very elegant bookend to Bishop Morlino’s life here with us in Madison for the past 15 years, so I had to share. HE WADES INTO CONTROVERSY, BUT HE IS TOLERANT OF THOSE WHO DISAGREE WITH HIM. 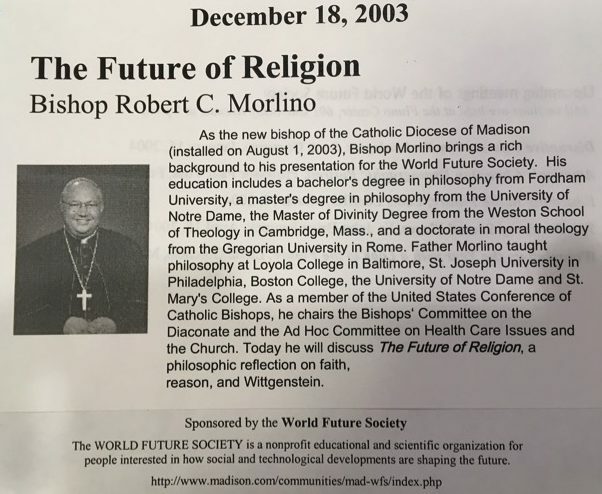 Bishop Morlino’s address to the World Future Society was one of his early encounters with secular Madison and was entitled “The Future of Religion.” It was presented at Fluno Hall on the University of Wisconsin Madison campus. Bishop Morlino pointed out during that address that Democracy maximizes individual freedom and minimizes restraint by the government. Thus it requires free self-restraint, which makes sense only in a religious framework. Government ought to favor authentic religion– when self-restraint under God is promoted, the government has less restraining to do. Religion, therefore, must have a future if democracy is to have a future. In hindsight now in 2019 with Antifa type disorder rampant, this prediction by Bishop Morlino made 15 years ago (in 2003) comes across particularly inspired. Hoping to share the nostalgic Wisconsin State Journal article with fellow Catholics who are mourning our loss of Bishop Morlino on November 24, 2018, I rushed to Wisconsin State Journal archives to find the link to this old article — only to find that in order to see anything more detailed than the fuzzy 2×2 inch image of the whole front page, readers had to subscribe to the Wisconsin State Journal($19.99/month). This inspired me to photograph, transcribe, and share excerpts of my newspaper clipping with my family and friends here below, with some occasional commentary. Six months after becoming spiritual leader of 265,000 Roman Catholics in southern Wisconsin, Robert Morlino is proving to be a bishop far different from any the Madison Catholic Diocese has seen before. He is at once more self-assured and, paradoxically, more humble than any of his predecessors, more willing to engage in public controversy on behalf of his church and more tolerant of those who disagree, a man who seems at ease with himself, his values and his abilities. He also begins his leadership of the diocese at a time when trends in the church that have been occurring for years are reaching crisis proportions. His priests are getting older and there are a few replacements in the pipeline. The result is that each pastor serves an increasing number of parishioners each year, parishes are being merged and ongoing scandals in the church at large are testing the faith of Catholics locally. Perhaps his biggest challenge, however, is confronting what Morlino sees as a pervasive secularism in Madison. Morlino said his first six months here have convinced him of the necessity for dialogue with the outside culture. He says he is somewhat surprised by the extent of the secular culture here and by what he perceives as a split between the culture of Madison and of the rest of the 11-county diocese. “I knew it theoretically before I came here, but I didn’t realize how strong that culture is,” he said. He does much of his teaching through his column in the diocesan newspaper, The Catholic Herald. In a recent column dealing with the referendum on expanding gambling at Madison’s DeJope bingo hall, Morlino put the whole issue into the reference of the cities alleged secularism. He said it is hard to argue against gambling in the city that welcomes abortion and the production of anti-Catholic plays, such as “Corpus Christi,“ a play that portrays Jesus and his disciples as gay. A national organization, America needs Fatima, has organized a protest against its performance, which is scheduled for March 5-27 at the Bartell Theater. “The kind of community we are seems to indicate a high comfort level with virtually no public morality,“ he said. His column reported in the front page story in the Wisconsin State Journal, elicited responses of both support and outrage. Both the State Journal’s and the Capital Times’ editorial pages criticized Morlino‘s position, and Capital Times columnist (Aside from Syte: calumnist?😂) Doug Moe wrote a piece on the newspaper’s front page taking the Bishop to task. The common thread in the editorial response was that Morlino hasn’t lived here long enough to pass judgment. Those who argue with him tend to do so from the perspective that in a pluralistic society, secular values of open-mindedness should prevail. The State Journal’s editorial page, for example, has been barraged with letters supporting and opposing Morlino. Philip Keillor, a Madison activist with a history of working with the poor, noted the city’s hard work in providing shelter for the homeless and suggested “moral minimums in our community seem to be developed on issues when there is enough agreement to ‘make it happen’ and those who remain uninvolved either accept or don’t strongly oppose controversial activities. Many Catholic readers, on the other hand, argue that a Bishop’s letter to the people of his diocese should not be read as an allegation of immorality on the part of non-believers. Morlino, 57, who succeeded Bishop William Bullock last August, is the fourth Bishop to serve the 11-county Madison Catholic Diocese. He is a native of Pennsylvania, the only child of a Scranton couple. His mother died when he was a teenager. Morlino was ordained a Jesuit priest in 1974. He holds a bachelors degree in philosophy from Fordham University, a masters degree in philosophy from the University of Notre Dame and a doctorate in moral theology from the Gregorian University in Rome. 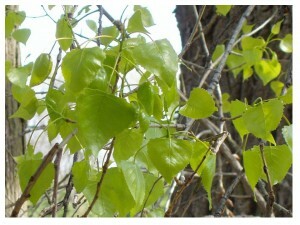 He is a large enthusiastic man who appears to enjoy company, love sports and doesn’t like being bound by rigid schedules. He doesn’t talk “down“ to people – which means, also, that he expects people to be able to hold their own when they speak with him. He had a diocese that was formed in 1946 and was led, successively, by bishops William O’Connor, who served from 1946 to 1967, Cletus O’Donnell, who served from 1967 to 1992 and Bullock, who served until 2003. If their tenures could be described by a single word – none would wish to be so described — O’Connor was a builder; O’Donnell was a national leader, Bullock was an administrator and Morlino is a teacher. Morlino writes long pastoral letters each Thursday in the Catholic Herald, on subjects ranging from support for the controversial orders of LaCrosse Bishop Raymond Burke (now Archbishop of St. Louis) on giving Communion to legislators who support abortion, to analysis of the best-selling novel “The DaVinci Code,“ to Marian devotions. 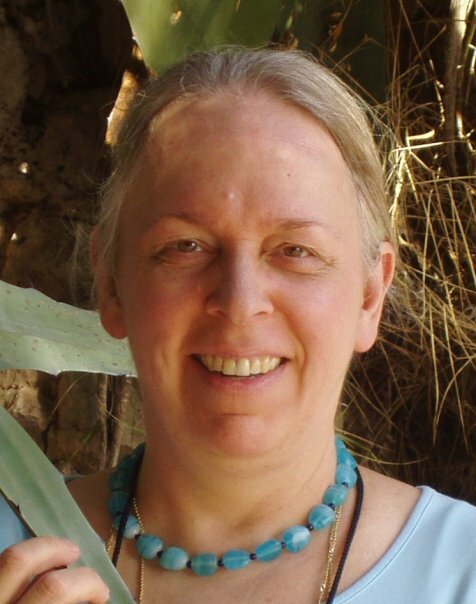 Lorraine Endres of Waunakee, a Catholic laywoman who says she hopes to be considered a good Catholic but who is not known as an activist, says most of what she knows about her new Bishop comes from his pastoral letters. Morlino confronted his Priests with a tightly reasoned multi-page letter on changes in Catholic worship having to do with confession and First Communion and, when asked by some priests for a simpler version they could share with their parishioners, he replied that cutting it down to five pages was as far as he could justifiably go. If Morlino expects his priests to bone up on their theology, however, he has also scored points with those same priests by announcing he won’t even read unsigned letters complaining about them. At the same time, Morlino has spent comparatively little time on administering the diocese, something Bullock prided himself as doing. During his first six months as Madison‘s bishop, he travel to other states for days and weeks at a time, sometimes to for fill commitments he made before arriving here, sometimes to take a few days off. 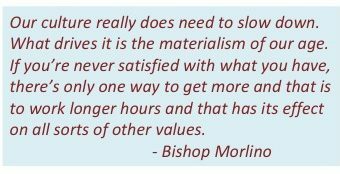 In an interview with the state journal, Morlino said it’s all a matter of emphasizing a bishop’s talents. Much of the work of actually administering the diocese has fallen to his vicar general, or second in command, Monsignor Paul Swain (Aside from Syte: now Bishop of Sioux Falls) who, nevertheless, says Morlino has brought a sense of zest to the office. Morlino may have best explained his concepts of personal strengths in a talk to diocesan young people recently in Wisconsin Dells. Morlino stunned his staff at the Bishop O’Connor Pastoral Center by giving each person two weeks off over the Christmas season. Those who had to work to keep the facility running were told to take extra vacation time later in the year. Telling his staff to take more time off also has its pastoral side, Morlino suggested. 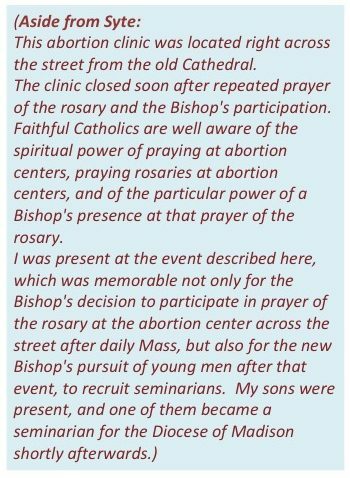 Morlino raised some eyebrows locally when, shortly after being installed as Bishop, he joined a group of abortion opponents in a march to an abortion clinic, where he recited the rosary. People weren’t surprised that he opposes abortion – all Catholic bishops do – but his predecessors hadn’t been involved in public marches. Perhaps more telling than Morlino‘s participation, however, was his admonition to his fellow marchers to love their opponents. Morlino said that’s just basic Catholic teaching. He applied the same judgment to politicians who may not conform to church teachings. The issue, Morlino continued, isn’t that politicians must take orders from the church, but they must live up to their own vocations. 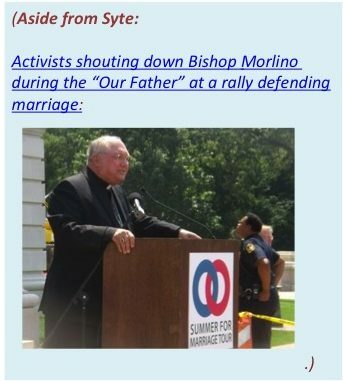 Morlino’s strong stance on social and moral issues seems to be popular with his fellow Catholics, many of whom are writing to the newspapers in support of him. Within his church, Morlino has been most controversial in Baraboo, where the pastor of Saint Joseph’s Catholic Church, the Reverend Gerald Vosen, was accused of sexual improprieties and was removed from office last September. 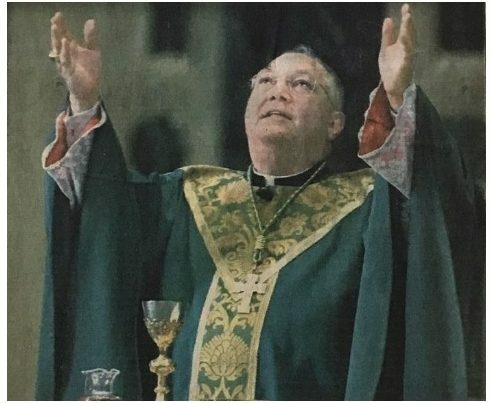 The man Vosen is accused of abusing denies the allegations (they were made by the man’s sister), but Morlino and the diocesan body charged with investigating sexual abuse charges have neither confirmed the charges nor returned Vosen to his pulpit. Morlino suggested, obliquely, that other allegations may have been made. At any rate, Saint Joseph parishioners– and even pastors of Protestant congregations in Baraboo – have protested and marched against what they perceive to be Morlino’s inaction. 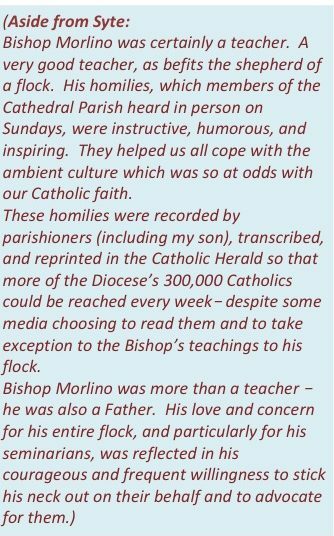 Morlino scoffs at the one-word descriptions of Bishop’s records cited above. Willingness to take strong stands on protecting victims of clerical sexual abuse, both in his own Diocese, and all the way up to supporting Archbishop Vigano’s calls for Papal transparency.